The latest research on multiple sclerosis treatment and the ketogenic diet indicates that the diet can be beneficial for MS patients because it supports and enhances mitochondrial energy pathways and alleviates detrimental energy pathway factors and nerve cell damage which contribute to MS. What that means is that the capability of a nerve cell to make fuel for itself in a way that is less detrimental is enhanced when one is in ketosis. In a paper by Stafstrom and Rho, the authors discuss the mechanisms of neuron (nerve cell) protection and how a ketogenic diet provides nutritional substrates which can support neuron function and total cellular health. Part of that support includes a reduction in what he authors call "glycolytic flux". This means that because less glucose is burned in the energy creation pathways of the cell, less oxidative stress is created and this reduction in free radical stress translates into healthier cells. Another study using mice also gave some indication on how a ketogenic diet can help reduce neuronal inflammation through this same mechanism. In addition, ketone bodies themselves are neuroprotective because when cells use them as energy substrates, more energy in the form of ATP is created and free radical or reactive oxygen species (ROS) production is reduced, which translates again to less overall cellular stress and more available energy for brain cells to use. In addition, the ketogenic diet enhances mitochondrial biogenesis meaning more mitochondria are made in the cell and that means more energy and better body health. Hence, the ketogenic diet is an effective multiple sclerosis treatment. And because dysfunctional energy creation pathways are at the root of most disease, it is not surprising that a ketogenic diet is also beneficial for many other nerve diseases such as epilepsy and Parkinsons. 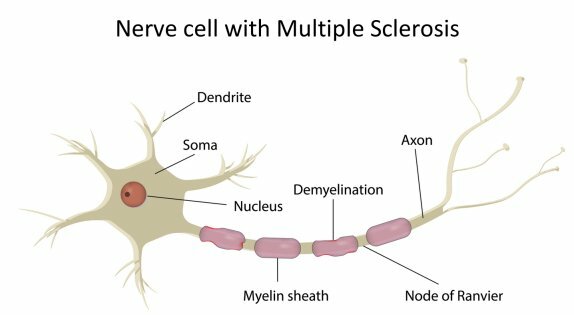 These results are particularly exciting given that MS is a result of an inflammatory and autoimmune driven process which causes damage to the myelin sheath around neurons. This neuron demyelation then results in damage to the ability of the nerve cell to propagate electrical signals and make proper connections to other nerve cells. The combination of benefits provided by the presence of ketones can normalize and enhance neuronal function, and this can then result in a return of normal body function. Dr. Terry Wahls has written extensively on how she used diet to recover from MS. As her research progresses, she is finding that moving toward a ketogenic diet is even more beneficial and she is in the process of setting up research protocols to look at the efficacy of the diet for MS. Her latest book is highly recommended. In it, she outlines her dietary protocol and how she is moving toward a more ketogenic approach. V. Capaldi is another MS survivor with an inspirational story. I met Ms. Capaldi at the 2014 Ancestral Health Symposium and was just amazed at what she has accomplished in improving her health just by changing her diet. Here's a great article she wrote about how her diet changes have transformed her life.